BRIDGETOWN, Barbados, Sep. 28, CMC – President of the Caribbean Development Bank (CDB), Dr. Warren Smith has reaffirmed the regional institution’s support for the government and people of COminica, following a high level mission to the hurricane ravaged island earlier this week. “CDB stands in solidarity with the Government and people of Dominica as the country seeks to rebuild and recover from this devastating disaster. We are acutely aware of the significant damage that Hurricane Maria has caused, and have mobilised resources for emergency relief and immediate response. 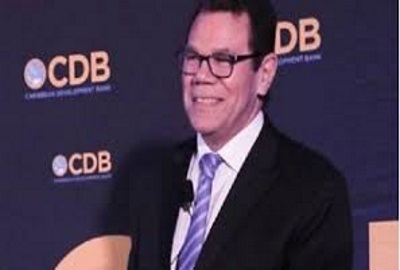 CDB reaffirms our continued support for Dominica to help the country rebuild more resiliently in the months and years to come,” said Smith on his return to CDB’s Headquarters. The CDB President, was part of a delegation that met with the Prime Minister of Dominica, Roosevelt Skerrit in the capital of Roseau to discuss rehabilitation and recovery efforts for the country following Hurricane Maria. Meanwhile, the bank has started making preparations to assist with the restoration of essential services including water and sanitation, and lend technical experts to support the recovery efforts. The Bank’s focus will include the restoration of the water supply in Roseau, where damage to the treatment plant at Antrim and associated pipelines has cut off water in the capital. CDB, which was in the process of upgrading the plant and equipment through its Third Water Project, is discussing with the Dominica Water and Sewerage Company Limited, ways to overcome the current logistical challenges to conduct the works, which will be critical in getting the water system running again in Roseau. CDB is in discussions with private consultants and development partners to provide short and medium-term assistance, including engineers and other technical experts, to assist line Ministries in Dominica in the recovery effort. The Bank is also discussing with regional utility groups and engineering associations opportunities for providing financial support and human resources to assist with recovery in Dominica. The bank has also discussed with the government, the option of re-prioritising the use of undisbursed balances on existing disaster rehabilitation loans for post-Maria recovery works. The delegation that visited Dominica included Dr. Keith Mitchell, Prime Minister, Grenada and Chairman of the Caribbean Community (CARICOM); Adriel Brathwaite, Attorney General of Barbados; H.E. Irwin LaRocque, Secretary-General, CARICOM; and Ronald Jackson, Executive Director, Caribbean Disaster Emergency Management Agency. ROSEAU, Dominica, Sept 26, CMC – Prime Minister Roosevelt Skerrit said Tuesday he is negotiating with the World Bank for US$100 million in loans and grants to help the island undertake recovery work following the passage of Hurricane Maria last week. Speaking at the daily news briefing, Skerrit said that the Washington0based financial institution has already agreed to 64 million dollars in loans and grants “and I am negotiating for them to take it to 100 million dollars. “They have asked me to come to Washington to further negotiate this package. I told them I would come if they will take it to 100 million, so we are trying to push them to take it to100 million US dollars in a combination of grants and loans,” Skerrit told reporters. He said that the island had received US$19 million from the Catastrophic Risk Insurance Policy and deposited at the Eastern Caribbean Central Bank (ECCB) and that a number of governments and agencies have been making commitments since the hurricane struck the island last Monday. He sought to re-assure citizens that food supplies were being received and would be distributed throughout the island as he urged people with transportation to assist in getting the supplies to needy communities. 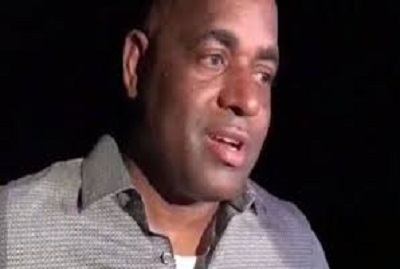 Skerrit said he was sending a letter to the University of the West Indies (UWI) urging that it does not take any action that would hamper the Dominican students there from continuing to pursue their education. 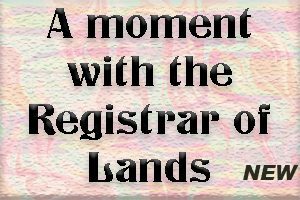 “We will make arrangements to keep our commitments to the University of the West Indies. We are also informing the universities, especially in the United States, where we have large number of students to indicate to them that oince the financial system is up we will keep our commitments to our students so they can be at school. “So I want all the students who are universities, who have commitment letters from the government, do not let your heart be troubled, we will keep our commitments to you so you can continue your education and our hope and prayer is that you come back to your country to help the country once you have completed your studies,” Skerrit said. He also urged people not to flock to the ports here seeking minor packages, indicating that the emphasis now is to get the major relief supplies moved quickly on arrival in Dominica. “I believe from next week we can start receiving personal packages where they can be sorted out and your family and friends can get it. The last thing I want in this country is for anybody to accuse the Customs, the Port and anybody else in the government system of stealing their packages. “We want to ensure that there are good government practices with respect to the receipt and delivery of supplies to the people, My assurance to the people is that the supplies will be distributed in a transparent, accountable, equitable fashion,” he said, urging the public to disapprove of rumours that would be “flying left right and center”. “Let us remain positive we have work to do, it is not easy, it is challenging,” he added. During the news briefing, representatives from the various services, including water and telecommunications provided updates on the progress to restore the services as quickly as possible.